There are many top highlights of Jaipur. 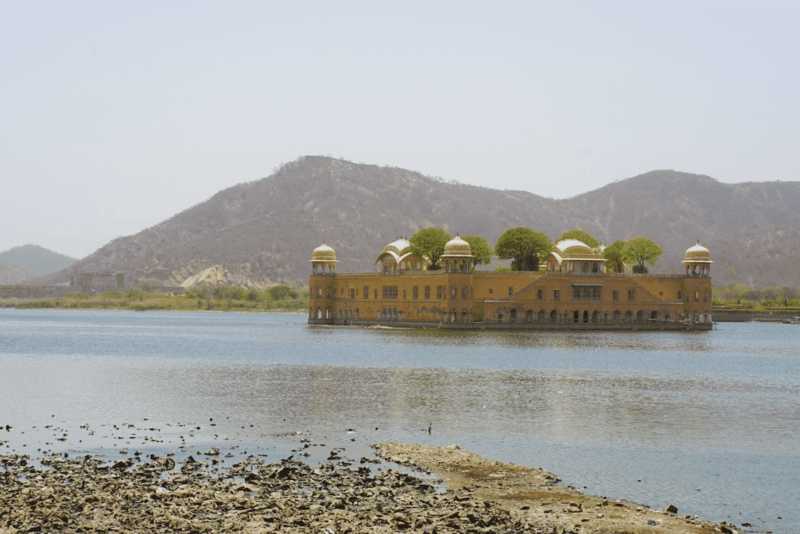 The historic capital of Rajasthan is colorful, chaotic and ripe for exploration. 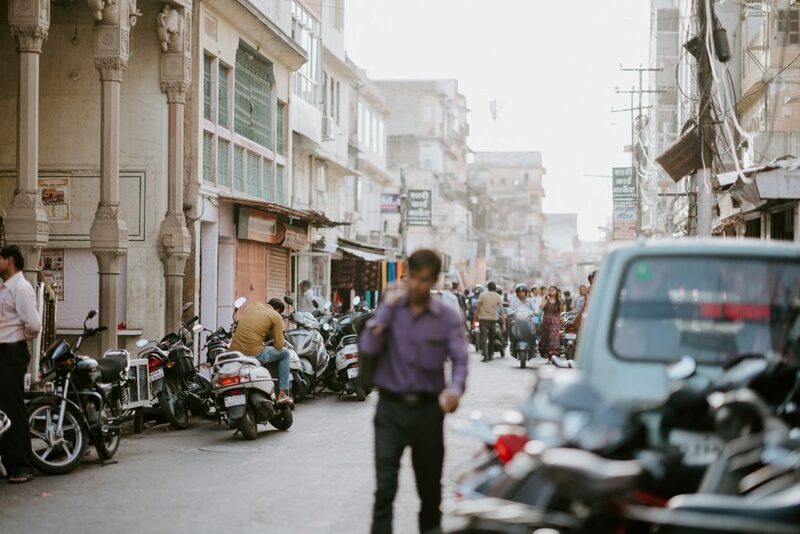 Hurling down the street on rickshaws between bazaars, hill forts, regal palaces and, every once in a while, a surreal pocket of calm. What’s not to love? 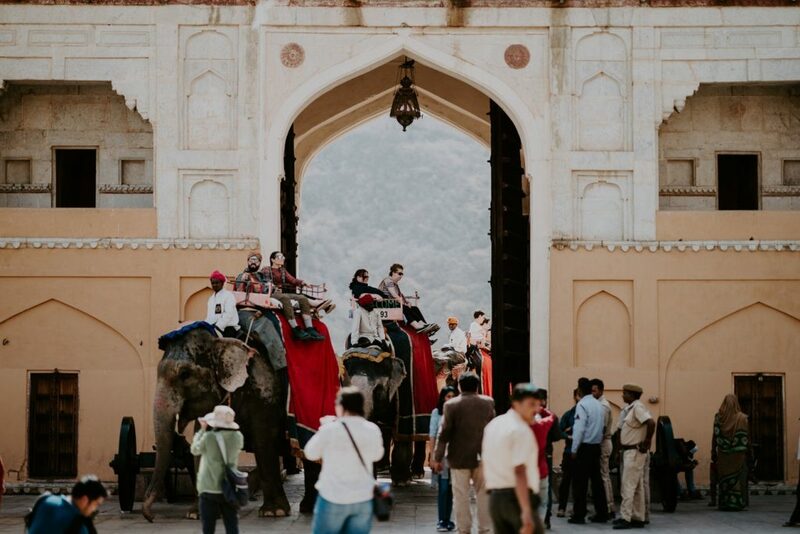 Jaipur, also known as the Pink City of India, is around 260 km from the Indian capital New Delhi and forms part of the Golden Triangle tourist circuit along with Agra. Every building within the walled historic center is painted a terracotta “pink” color and there are few exceptions to this uniformly color scheme. It may be hot, crazy and overwhelming but with a few chai breaks, you will soon fall in love with this cities style and panache. 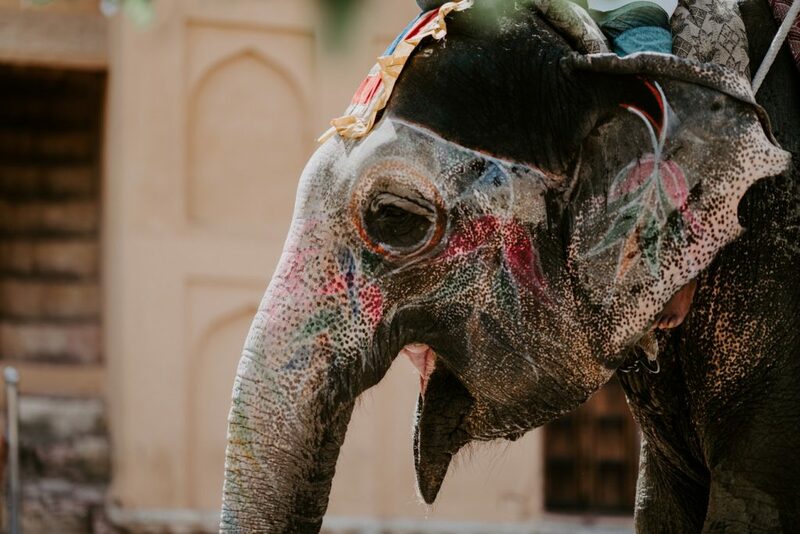 Whether you are booking train tickets in India or hiring a driver to explore, here is my guide to a few days in Jaipur to inspire you to visit. 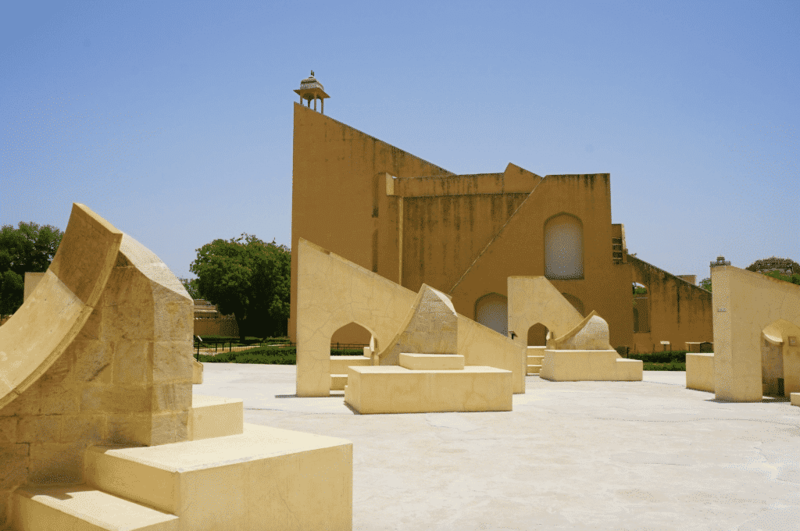 There are plenty of observatories all over the world, but the Jaipur Jantar Mantar (a UNESCO site) is one of the largest observatories ever built and feels a bit like a weird theme park to explore. Combining religion, science, and art, the Jantar Mantar was built during the 1720’s by the Maharaja and houses the world’s largest sundial. The various architectural and astrological instruments here will largely be of interest to astronomers, historians, and architects but it is a nice park to be enjoyed by all – And of course its interesting for anyone to see how they studied the skies in the past! Who would have thought maths would be one of the highlights of Jaipur! Albert Hall, the oldest museums in Rajasthan, is found amid the gardens of Ram Niwas Bagh in Jaipur. 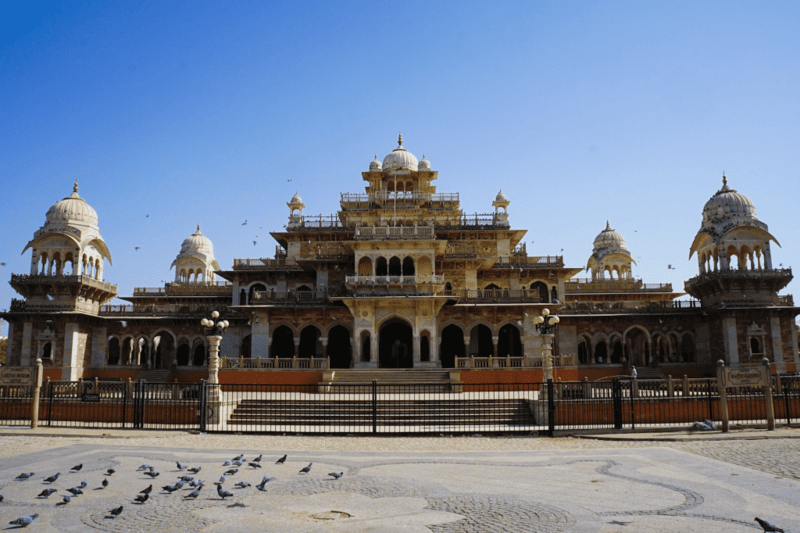 It is based on the Albert Museum of London and showcases a fusion ‘Indo-Saracenic’ style of architecture quite different than the rest of Jaipur. Albert Hall exhibits a rare collection of ancient arts including miniature paintings, carpets, metal and wood crafts, toys, dolls, arms and weapons and, weirdly enough, an Egyptian mummy. Worth it just to check out the building, the museum is definitely dated but still has some rather interesting pieces. The Indian state of Rajasthan is famous for its royal heritage and its many forts and palaces. Nahargarh Fort, along with other two forts [Jaigarh Fort and Amber Fort] historically formed the key defense for Jaipur city. 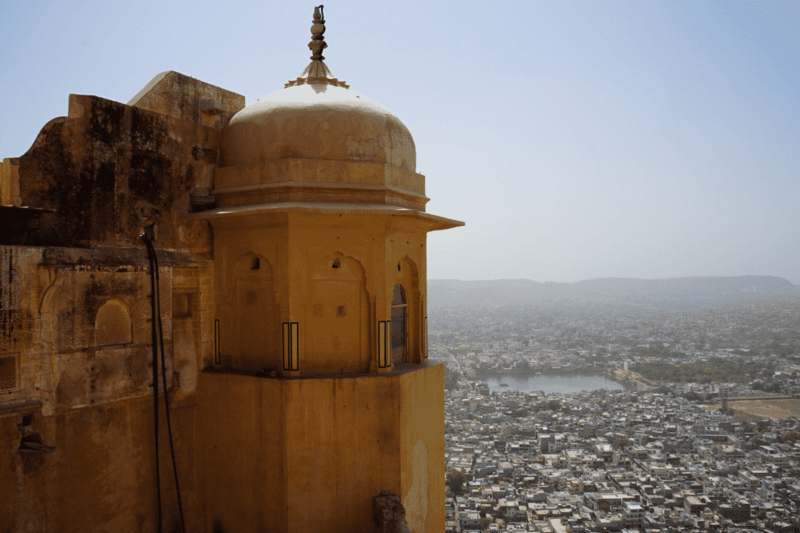 Situated in one of the oldest mountain ranges of the world, the Aravalli Hills, this Nahargarh Fort gives you a truly breathtaking view over Jaipur and the surrounding countryside. Not quite as cool as the Ranthambore Fort within the Ranthambore National Park, and all it’s wild tigers …But pretty darn close! 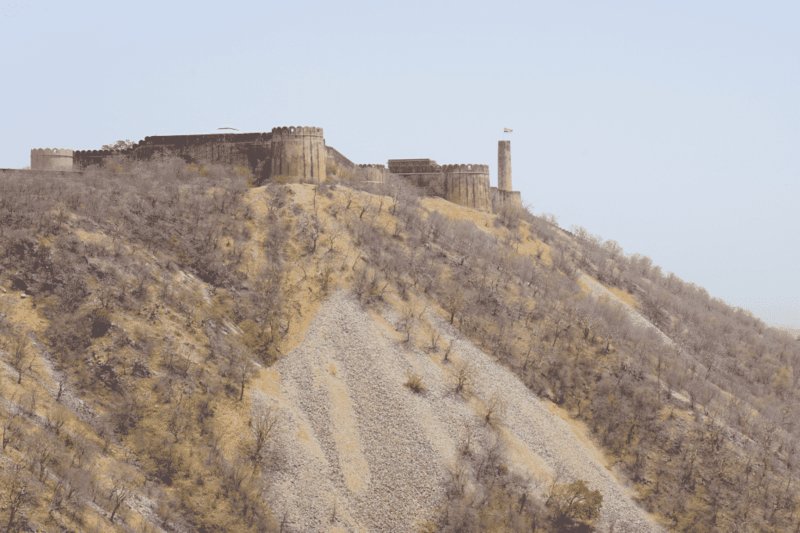 The Jaigarh Fort is a majestic stronghold, a largely-intact fort connected to the Amber Fort via subterranean passages for a quick escape. The fort claims to have the world’s largest cannon on wheels (um..OK??). Probably the weakest of the three forts discussed here but still worth it as in the same area. Also has a group of rare black-faced macaque monkey out the front if you get bored. Finally, the fort is apparently famous for having a huge treasure trove buried within the fort…Share with me if you find alright guys! 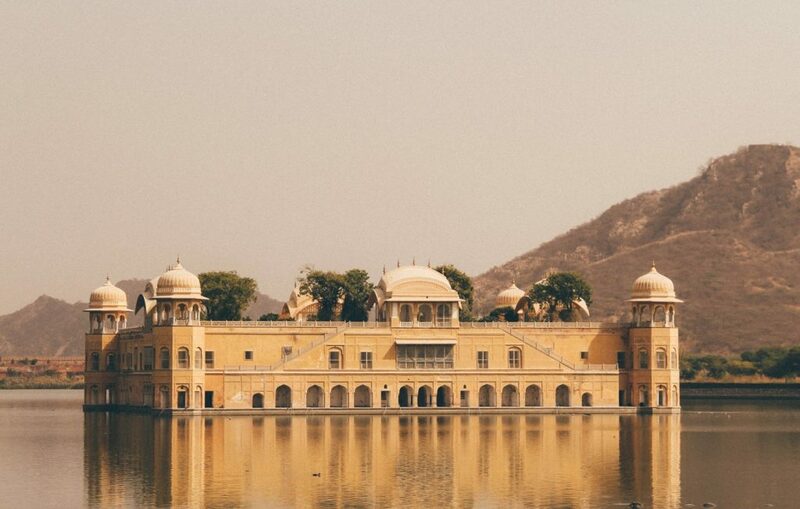 One of Jaipur’s pockets of serenity, the beautiful Jal Mahal [the Water Palace]. is a smallish palace, that once was a shooting lodge for the Maharajah, ‘floating’ in the center of Sagar Lake. The light sand walls contrast against the deep blue water with peaks of foliage luring you in. Unfortunately, admiration from the roadside is currently the closest you can get to the actual palace as it is currently being transformed into an ultra-exclusive restaurant, but hey – maybe it’s open when you go? 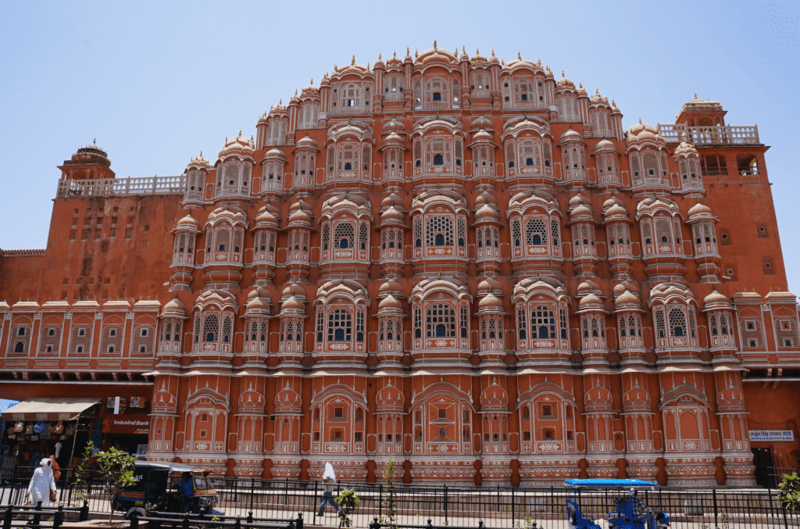 The Hawa Mahal [ the ‘Palace Of The Winds’] is the most famous site in Jaipur city. One of my favorite Jaipur highlights I could have spent hours at! The Rajmandir is a beautiful film hall which blurs the boundary of traditional cinema and will showcase more than just movie. 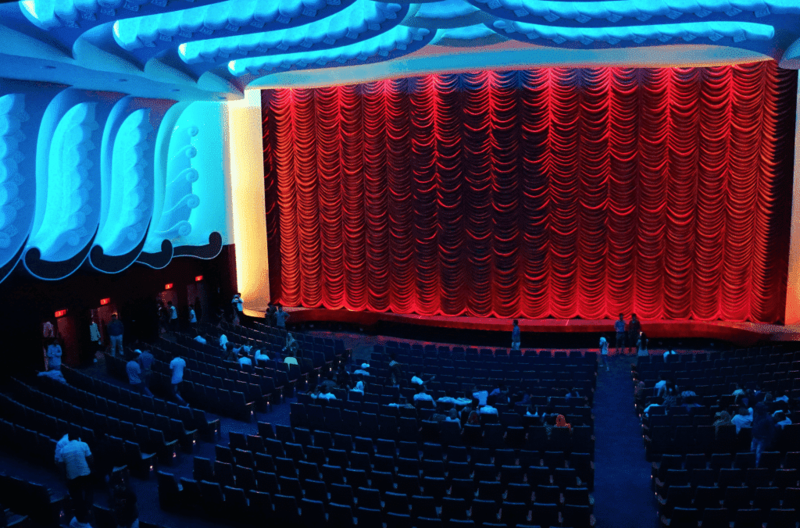 Home to many Bollywood movie premiers, this cinema makes for a great night out and can showcase a taste of Bollywood. Be careful however that the film you are watching has subtitles, as ours did not and we were left guessing what happened the entire time. Not bad for a few dollars in the cheap seats however and those Bollywood dance scenes need no translation! This is definitely one of the untouristy Jaipur highlights! Serving “extra-special” Indian selections the Peacock Rooftop is an amazing place to spend the evening at a great price. 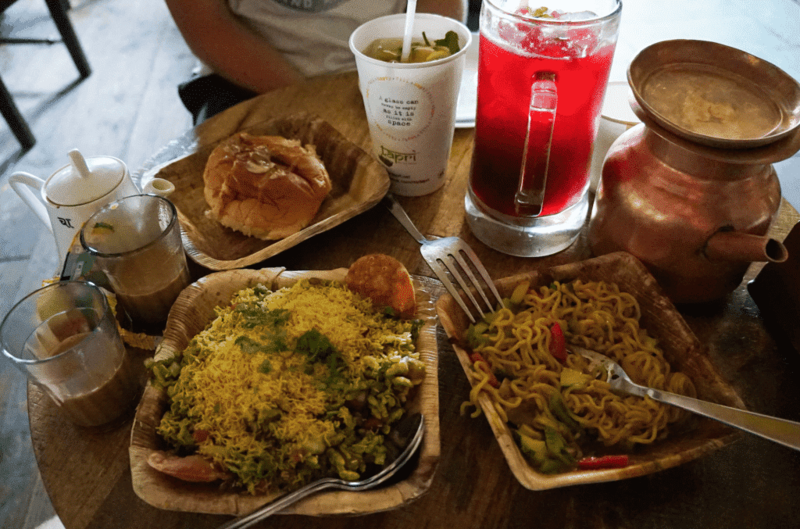 Amazing atmosphere and tasty drinks and food made this one of my favorite places not just in Jaipur but the whole of India! The restaurant is themed after the national bird of India – The Peacock, and provides a calm place where you can sip a chai tea or have a bite, admiring the old Hathroi Fort only meters away. 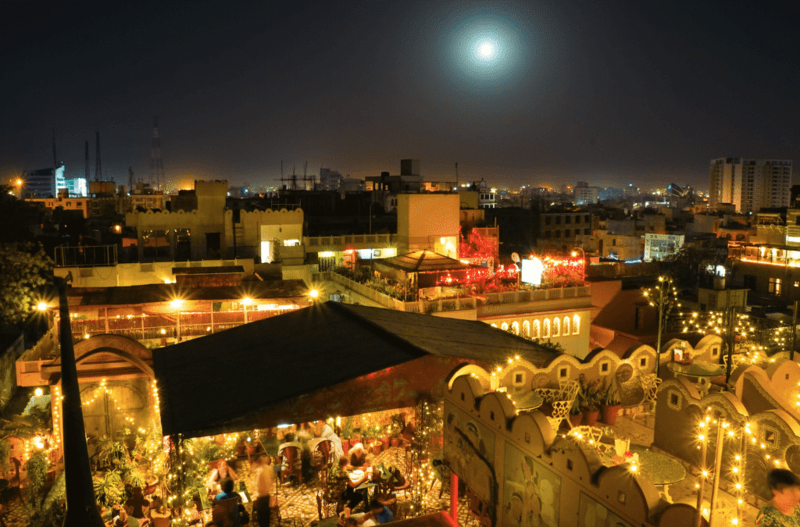 The quirky decor and the talented chef surely makes this Jaipur’s best rooftop! Call ahead for a reservation to ensure you are not disappointed. 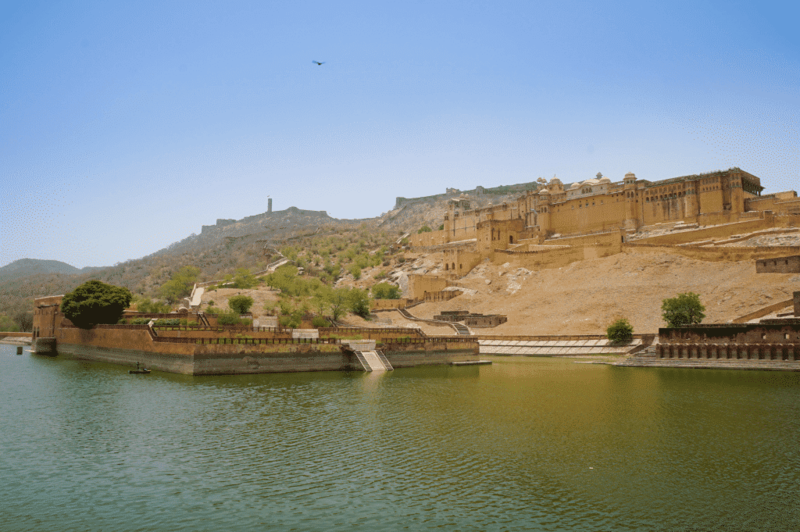 The ‘Amer’ or ‘Amber’ Fort located 11 kilometers from Jaipur, is the most famous fort of Rajasthan and was originally the capital of the state. It is the oldest of the three forts, and the most impressive, being built in 1592. It is built in red sandstone and marble which glisten in the sun and the Maotha Lake at its front add another dimension to the entire place. It may look old from the outside but is well worth exploring the rooms inside to see how it has undergone the influence of both Hindu and Muslim architecture. Half a day minimum to explore this gorgeous beauty as is not something you want to rush but please, please don’t support the elephant riding here…Looked horrible and almost made me cry!